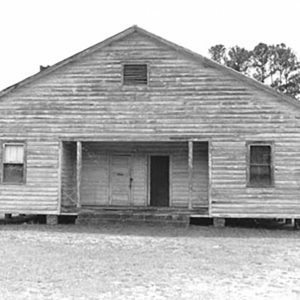 This two-room school was built under the leadership of Ervin Johnson, a local African American carpenter in 1929. It served students in grades one through eight. At first funds were so scarce it was only open from October to March. Eventually however, donations from the black community allowed it to operate for a full school year. Later, high school courses were offered. This remained the only black school in town until the Hampton Colored High School was built in 1947. Then it was converted into the lunchroom for the high school. Marker erected by Hampton County Historical Society, 1989.